An array of institutes and lead specialists on breeding across West Africa convened at IITA-Ibadan for a workshop on 12–15 March, to discuss and exchange ideas on how they can work together to bring best practices and tools that can help them achieve their objectives more effectively, efficiently, and within a relatively shorter time scale. The 4-day workshop themed “West Africa Transforming Breeding,” aims to look at ways to modernize and transform breeding strategies, increase efficiencies, and develop the capacity to increase the rates of genetic gain in West Africa. Breeders and associated researchers as well as program leaders from the International Maize and Wheat Improvement Center (CIMMYT), International Crops Research Institute for the Semi-Arid Tropics (ICRISAT), AfricaRice, and IITA, attended the workshop with a shared vision of pulling together national, regional, and international partners to synergize efforts to increase agricultural productivity levels, farmers’ yield and income, establish a rationale of sustainable improvement, and also highlight the scientific innovations being deployed by breeders, as a starting point for building a globally unified community of practice around modern breeding techniques. 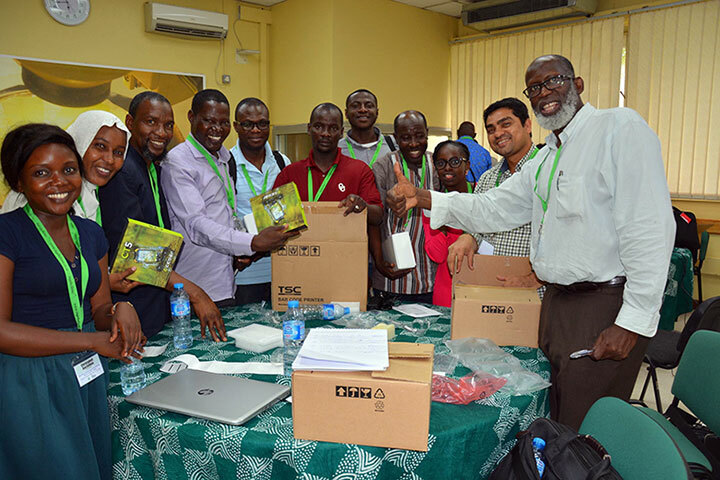 The workshop was jointly sponsored by the Excellence in Breeding (EIB) platform, Genomic Open-source Breeding Informatics Initiative (GOBii), Integrated Genotyping Service and Support (IGSS), the High-Throughput Genotyping (HTPG) platform, and the Next Generation Cassava Breeding program. The call for transformation in agriculture is now being embraced by breeders, who, in discussion with public and private sector investors, are working to redefine and transform breeding. This is because plant breeding is a long-time investment, which can succeed if it is sustained. African agriculture is changing, and central to this transformation is identifying the market demands and developing agricultural products that meet this demand. 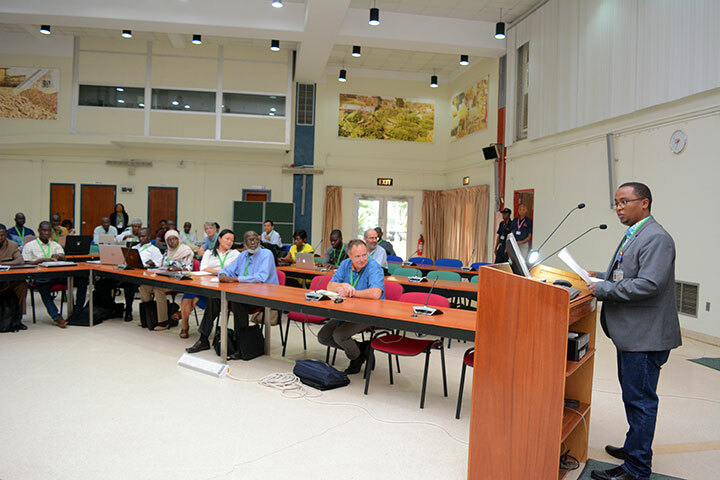 In his welcome address, IITA Director General Nteranya Sanginga applauded the spirit of enthusiasm and cooperation among participants, and acknowledged their collaborative effort. “IITA is 50, and we are proud of the tremendous impact the Institute has made globally. I am certain that with this set of experts, we can continuously transform breeding in West Africa, but we cannot transform breeding without addressing the issues of agronomy. I urge all participants to seize the opportunity to come out with new proposals as we aim to combine the science of discovery with the science of delivery, to ensure full sustainability of improved crop varieties and their related value chains within the region,” he added. 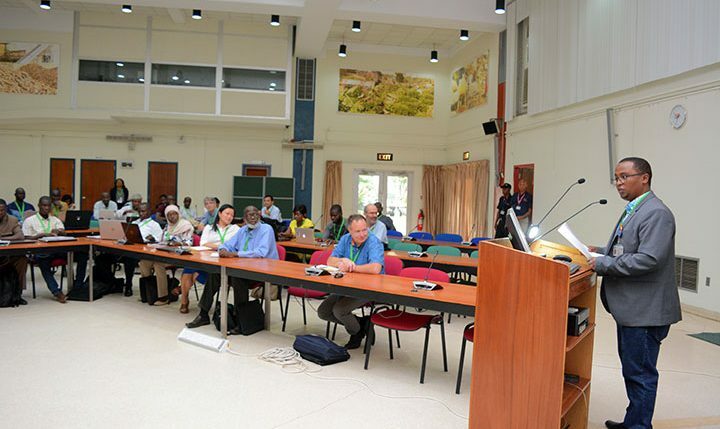 Agreeing with DG Sanginga’s address, Ismail Rabbi, IITA Molecular Geneticist, encouraged the participants to learn, interact, and discuss practical issues on how to engineer and harmonize breeding programs to make them more resourceful and sustainable. During the plenary session, topical presentations were made by stakeholders that cut across the various breeding pipelines, ranging from breeding strategy, and process optimization, data management and systems integration, sample tracking, genomic selection and analysis pipeline, genotyping data management, and marker application tools. A way forward in subsequent years was also deliberated upon. The session incorporated the presentations of two keynote speakers titled “The components of a modern breeding program; sharing an industry perspective to genetic gain” by Stella Salvo, Precision Breeder for Asia- Africa, Monsanto, and “Entering the age of genomic breeding: Big steps for a small program” by Clay Sneller, co-Leader of the Integrated genotyping and support platform (IGSS) platform, both directed towards redefining, strengthening, and transforming breeding with the objective of making significant impact among smallholder farmers in Africa. This change in attitude and practice of breeders aims to increase productivity and profitability of crops in Africa, and to meet the ever-increasing food demand across the population due to changes in diets and standards of living. The breeders also emphasized that new plant varieties need to be developed and adapted to meet these varied market needs.